When Raymond C. Pierce was growing up in Cleveland, Ohio and envisioned his future, he never considered one day running a venerable education advocacy group in the South. 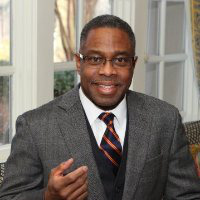 Today, the 58-year-old attorney is the new president and chief executive officer of the Southern Education Foundation (SEF), a research and public-policy group formed in 1867 to promote equity and excellence in education for low-income students and students of color in southern states. Leading a historic nonpartisan group like the Atlanta-based SEF was never on his wish list, Pierce said. But when a colleague approached him about the open position last year, it made sense to drop his private-enterprise pursuits and turn to championing advancement for those who need the help he could give. Pierce – a first-generation college graduate raised by parents who moved North from Mississippi – brings a range of credentials to the SEF. He spent his early years learning the importance of education and service from his parents, uncles and a grandfather whose parents were slaves. He earned a bachelor’s degree at Syracuse University and a law degree from Case Western Reserve University, going on to learn the ropes of civil rights law starting in Little Rock with legal legend John Walker, who was working with the NAACP Legal Defense and Educational Fund to address racial discrimination and funding inequities in education. From 1993 to 2000 during the Clinton Administration, Pierce was deputy assistant secretary at the U.S. Department of Education in charge of its Office for Civil Rights. Later, he served as dean of the School of Law at North Carolina Central University. Beyond civil rights law, Pierce worked in private practice with regional and national law firms on corporate, banking, and education matters. He serves on various boards and committees, including the executive committee of the Council on Legal Education of the American Bar Association, which oversees accreditation of law schools across the nation. Beginning at the local and state level to address such issues is part of Pierce’s plan. The SEF can “get in front” of some issues in state legislatures, he said, noting that part of his job is to raise money to supplement the SEF’s $20-million endowment as the foundation seeks to sustain and expand its advocacy. Pierce and others on the front lines of advocacy for education have their hands full, according to H. Patrick Swygert, a law professor and higher education consultant who served as president of Howard University from 1995 to 2008.